Gentle Grooming STRIPHAIR Original, special harness for the change of coat, for cleaning the horse, also excellent for the shower. It removes dirt easily, cleans and polishes the horse coat, helps to remove excess hair during moulting, without risking to ruin it. Also useful for the shower, being in technical resin does not present the risk of mold or rust. 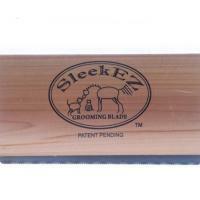 The groomer measures 22.5 cm by 5 cm, being flexible provides the best solution for grooming the whole body of the horse, washing, bath and even massage. The angled parts of the back are perfect for the snout and the bony areas along the hocks and legs. The Gentle Groomer Original StripHair by Betty's Best with registered patent, used at a 45-degree angle, gently removes the hair, with a polishing effect. Its diamond structure effectively removes mud and sweat (also dried), and also removes shampoo and other detergents during the washing of the horse. The special blend makes the rubber durable and long-lasting, olive and orange oils increase the durability, performance and benefits of this special curries. Its non-porous structure and antimicrobial agents maintain a long-lasting antibacterial efficacy. Due to its flexibility and resistance it is comfortable for the horse and effective for the rider, offering a great time saving, convenient and multi-functional, a single all-in-one tool for cleaning, grooming, seasonal change of coat horse's fur, shampoo, smooth, shine and massage. Delicate and effective, to be used with ease and without any danger on horses and dogs, in every part of the body, perfect and safe for every need.